If a has tire deflated more than 25% from the recommended pressure, the likelihood of a tire-related crash increases threefold. Therefore, it’s crucial to know about every leak your tires may have and fix them in time. Valve stems deteriorate and leak air due to the exposure to lots of chemicals on the road. Usually, drivers get a new set along with the new tires. However, if a tire loses air slowly yet over 1-3 psi a month, they may need replacement earlier. Over-tightening valve cores may also be one of the reasons of the leak. The torque should be about 4 inches per pound, so you may need a pre-set wrench. The wheel may partially lose its perfectly round shape due to corrosion or hitting a road hazard. Also, if corrosion is present at the surface where the tire is mounted, the air loss may be greater. A bent wheel will also contribute to the vibration of the vehicle, which may damage the tire’s bead, contributing to the air leak. If you see any of these issues, make sure to visit a technician and get a consultation on changing the valve stem or repairing the wheel. They can puncture the tire and cause air to leak at the rate of 2-3 psi a day. 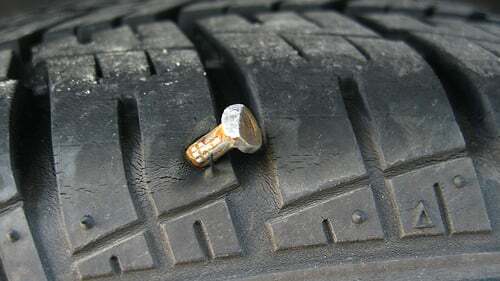 A nail may remain in the tire and cause seemingly insignificant air loss. But it still needs to be extracted. If it isn’t the leak could get worse and your tire may need an urgent repair to make sure you don’t get a flat tire. Any sealing surface between rubber and metal can cause loss of air. Bead chunking, a small piece of debris between the rim and the tire etc., can open a small window for the air. Age also contributes to the seal breaking, as the rubber weakens over the years, losing its elasticity. That’s why it’s so important to know the age of the tire before you buy it. Finally, the bead may sit improperly on the rim due to inexperienced technician work, and as a result, the tire loses air slowly. Another damage due to road hazards. 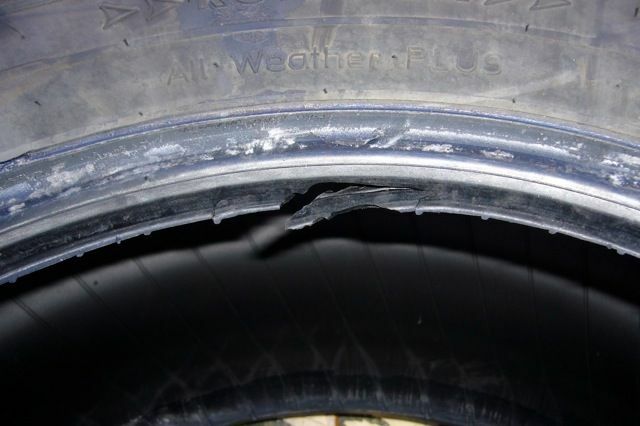 Driving over a large pothole or a curb may flex the tire sidewalls and make the tire lose air. If there is no damage to the tire-wheel unit, you may just need to re-inflate the tire. However, check for any sidewall bulges, cuts, and punctures. These may indicate an internal or external damage that could contribute to the leak. When you notice your tire loses air slowly or it’s time for a routine check at a mechanic, make sure to look for all this damage. Some of them, like a small puncture, may be reparable, and the sooner you do it, the better. A tire loses about 2% of the air with every 10°F drop in temperature. Accordingly, it rises 2% with every 10°F rise. So, light passenger cars may lose/gain about 1 psi, while pickups and buses may lose/gain 2 psi. In most part of the US, the difference between day and night temperatures is about 20°F. So, if your vehicle spent a night outside in the cold and you find the tires are underinflated in the morning, don’t rush to add pressure. While you drive, the inflation will return to the norm by the afternoon. Pressure changes according to the temperature because air expands when heated and shrinks when cooled. The amount of air is still the same, so if there is no other damage, keep the pressure as it is. In the easiest cases, you may manage to find the leak by sound or feel. There will be a distinctive hissing sound, intensifying as you get closer to the leak. Touch the tire in that place and feel whether there’s air loss. If the tire is hot, the place with the leak or damage will feel hotter. You can add any soap or 20% detergent into a spray with water and spray the tire and rim edge. Cover the valve stem with the mixture first, then the inside and outside edges of the rim. You can also pour some on the tire sidewalls and tread to see if there’s any damage you might have missed. Bubbles will appear where the leak is present. However, remember that you may need to wait about 5 minutes before you notice the place where your tire loses air slowly. By putting the wheel into water. Remove the wheel from the vehicle and put it into water. The leaky part will start to release small bubbles and show itself. The puncture or other damage may be on the other side, so if you don’t see it in 5 minutes, turn the tire over. Usually, the soapy water method works perfectly even for small punctures. It’s also the easiest and least time consuming, as you don’t have to demount the tire. Repair and/or restore the rim. NOTE: Not all damage to the wheel and tire are reparable. Some repairs are temporary, giving you some time to get to the nearest tire shop. But you should never drive with temporary or poor-quality repairs on a daily basis. You can repair a puncture at a technician workshop or at home. If you want to do it yourself, use tire sealants or a special plug kit. You will need a sealant, an air pump, and a pressure gauge. 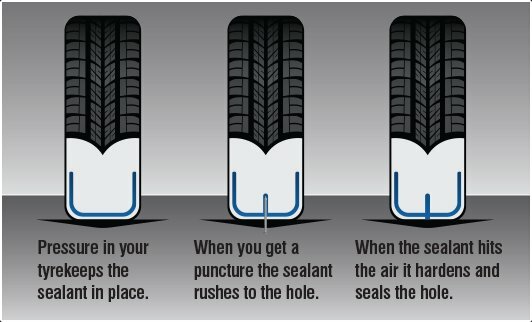 Insert the nose of the sealant into the puncture where the tire loses air slowly from, or the valve. Make sure you adjust it so that the sealant is pouring right on the inside surface of the tire. Pour it carefully until you use a whole standard bottle. It will work as a protective layer inside the tire, so when you pump it up, the pressure will push the mixture into the hole. Thus, it will form a rubber-like plug, repairing your tire. There are pre- and post-puncture sealants, so buy the latter if your tire loses air slowly. NOTE: Make sure you look for propylene glycol sealants. There are also those based on ethylene, which is toxic for humans and may be dangerous for tires after some time. 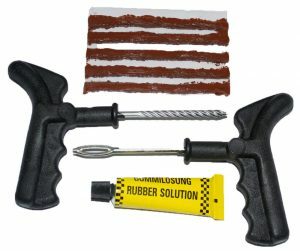 A standard tire plug kit. A plug kit consists of a set of plugs, rubber cement, reaming tool, and a plug tool. Also have pliers or another tool ready to take the nail out of the tire. You may need a car jack and a lug wrench if it’s more comfortable for you to repair the tire on a removed wheel. However, you can do it with the wheel on the vehicle. Firstly, remove the nail from the tire and use a reaming tool to clean the hole and make it fit the plug. Be careful not to make the hole too large, or you can do more damage so your tire loses air slowly or go flat instantly. Then, insert the plug into the plug tool and cover the tip of the tool with a bit of rubber cement. After that, insert the plug into the hole in the tire and pull the tool out of it. Cut the plug that remains on the surface as close to the tread as possible. After it dries, you can pump the tire up and drive safely for some time. NOTE: Remember that such repairs are suitable only for tread damage. If you fix the sidewall like that, the tire may blow out any moment. You will need a valve removal tool and a new valve core. You may also need a car jack and a lug wrench to remove the wheel if you find it easier. 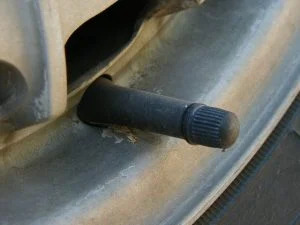 Remove the valve core on the wheel where the tire loses air slowly by inserting the removal tool tip into the stem and rotating it counterclockwise. If you see signs of corrosion, make sure to clean the stem before installing a new core. Screw a new core in place and pump the tire up. NOTE: Make sure to wear protective glasses, as the old core or debris from the stem may hit you. If you have a bent wheel, it’s better to go to a mechanic that offers hydraulic assistance. This is one of the newest and most efficient ways to straighten a wheel. NOTE: Never hammer your aluminum alloy wheels, or they may become totally broken. Aluminum is quite brittle, so more gentle means should be used to fix such rims. 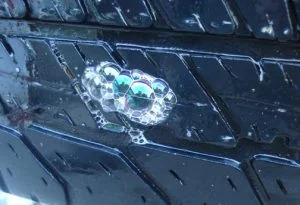 What you can do yourself is clean the wheels from corrosion, as this is one of the reasons why a tire loses air slowly. You will need to remove the wheel from the vehicle and dismount the tire. Then you will need sanding tools, aluminum metallic polish, and wax (optional). Clean the wheel and degrease it, then remove all the paint and previous finishes. Sand all its parts thoroughly, including the space in between the spokes and inside the lug-nut holes. Use a low-speed sander to clean the center of the rim, and polish it all until it gets shiny again. Let it dry and apply wax if you find it appropriate. NOTE: This is only one of the methods for cleaning a wheel of signs of corrosion. You can alter it according to your wheel type and manufacturer specifications. You should also wear protective glasses and gloves to ensure safety. Check air pressure in your tires once a week to make sure you know whether any tire loses air slowly but more than the others. Make sure you check the tires while they are cold. It’s not mandatory to wait for a lot time for the tires to cool down – 2 hours should be fine. Also make sure the car has been in the shade before you check the pressure. If you’ve been driving for over 15 minutes or the car has been in the sun, remove 2 psi to see the real inflation rate. Use a calibrated pressure gauge. At some tire stations they calibrate pressure gauges, and you should do it to get the right reading. As a tire loses air slowly, every psi loss is important to notice. Even a new gauge may show about +/- 3 psi, which is quite a lot of change for light passenger cars. Also, choose the most appropriate tire gauge type for you: stick, digital, or dial. You can see their benefits and drawbacks by reading a buying guide. Read your vehicle owner’s manual or look for the information placard on the door jamb. There you will find both the maximum load/inflation and the recommended amount. It’s crucial that the tire load index is the same or exceeds the index you see on the placard. The information on the load index can be found on the sidewall of the tire as a part of its code. 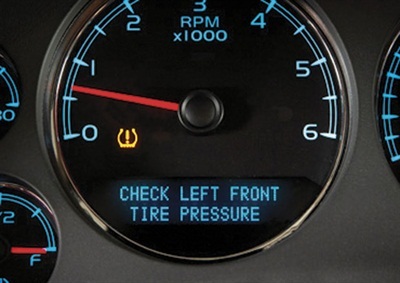 Tire Pressure Monitoring System is present in every vehicle manufactured after 2007. It helps detecting whether any tire loses air slowly and excessively. When pressure goes lower than 25% from the recommended standard, the system warns the driver with a sign. Unfortunately, according to a survey, only 58% of drivers can identify the sign. 21% won’t believe their vehicle systems and will continue driving until they can see the damage themselves. Nevertheless, TPMS is a mandatory system approved by NHTSA and a great help for those who use it. About 75% of roadside flat tires happen because of negligence when a tire loses air slowly. A vehicle only can carry the specified load if the tires have enough air in them. Proper tire pressure prolongs the tire’s life, as if over- or under-inflated, the tire starts to wear irregularly. Improper tire pressure may increase fuel consumption by about 3%. Improper pressure will provide less stability for the vehicle and more risk of flats and blowouts. For light passenger cars, the average psi standard is 35, and such tires become dangerous at 28 psi. So, even 5-7 psi makes a difference. Therefore, when one tire loses air slowly but more than the others, it needs attention.